Services - Allstar Paving Co., Inc. | Allstar Paving Co., Inc. Here at Allstar Paving, we’ve been providing service for commercial, industrial, multi-family residential and homeowner’s associations for nearly 30 years. We’ve built our business by maintaining long-term relationships with our customers, and treating new clients with the same courtesy and professionalism. Below you’ll find photos and descriptions of the services we offer. Pothole Repair – Nobody likes to drive over a pothole, not the parking lot owner and certainly not a customer. Potholes not only rattle nerves but can cause damage to tires, rims and wheels, as well as create a potential safety hazard for pedestrians. If repaired soon after they appear, potholes are relatively inexpensive to fix. Allow them to further deteriorate and, more than likely, additional work and material is often required. If you spot a pothole developing on your property, give Allstar Paving a call and we can quickly come out and assess your needs. Resurfacing/Skin Patching – Resurfacing (re: skin patching, overlaying) is recommended when the underlying base is structurally sound with minimal cracking, but the surface is depressed, severely eroded or roughened from water. A number of factors can lead to these failures. For starters, an infrequently sealed surface lacks the protection to withstand long-term exposure to high-traffic volume. The subsequent turning and grinding of tires quickly erodes the pavement. Additionally, poor drainage due to a flat grade can cause water, such as excessive runoff from irrigation systems or heavy rain, to sit in a particular area for a long period of time and erode the asphalt. As part of the repair process, the damaged pavement is thoroughly cleaned and tack coated with a bonding agent. 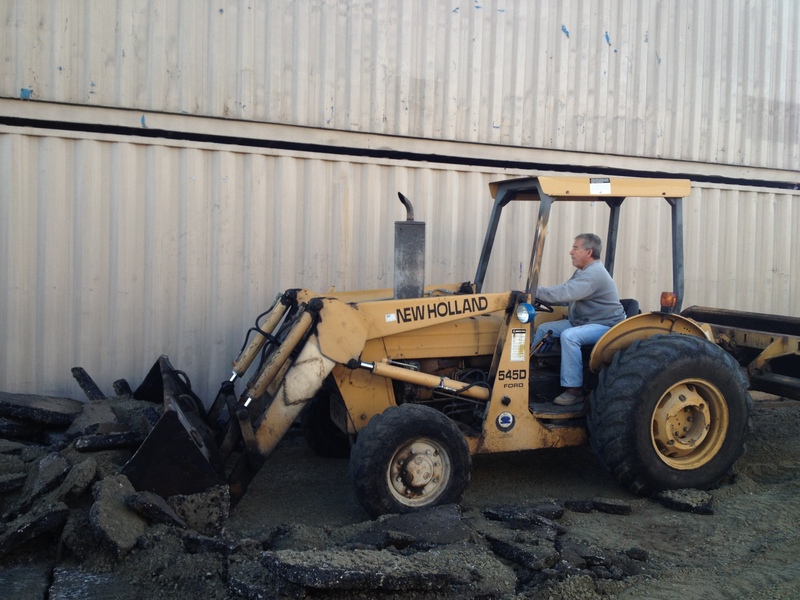 The new layer of hot asphalt is installed over the damaged area(s) and mechanically compacted with a roller. 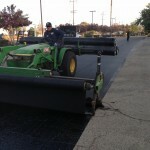 Because the new asphalt is applied over existing pavement, the edges are feathered to create a seamless border. After the repairs are completed, it’s recommended that the entire lot be seal coated and re-striped to create a uniform appearance and to protect the surface from the damaging effects of the sun, oxidation and water damage. Removal & Replacement – Better known in the industry as R&R, this service is typically reserved for more severe deterioration and outright structural failure, especially when the underlying base has been compromised. The damaged areas are squared off, then removed and excavated to the appropriate depth. Next, the existing sub-base is re-graded and re-compacted, and the new full-depth section of hot asphalt is installed in two or more compacted lifts. A heavy roller is utilized for maximum compaction. In some cases, such as water-saturation, new rock base may be recommended. At this point, and prior to asphalt installation, the area in question will be excavated deeper to accommodate the new section of rock base. Similar to asphalt installation, the rock base is installed and compacted in multiple lifts in preparation for the new asphalt section. As with resurfacing, the entire surface should be seal coated to better protect and enhance the appearance of the asphalt. Petromat Overlay – Occasionally, a parking lot has such widespread deterioration and cracking that patching is not the best option. In that case, Allstar Paving might recommend a Petromat overlay, or fabric overlay, as it’s sometimes referred. 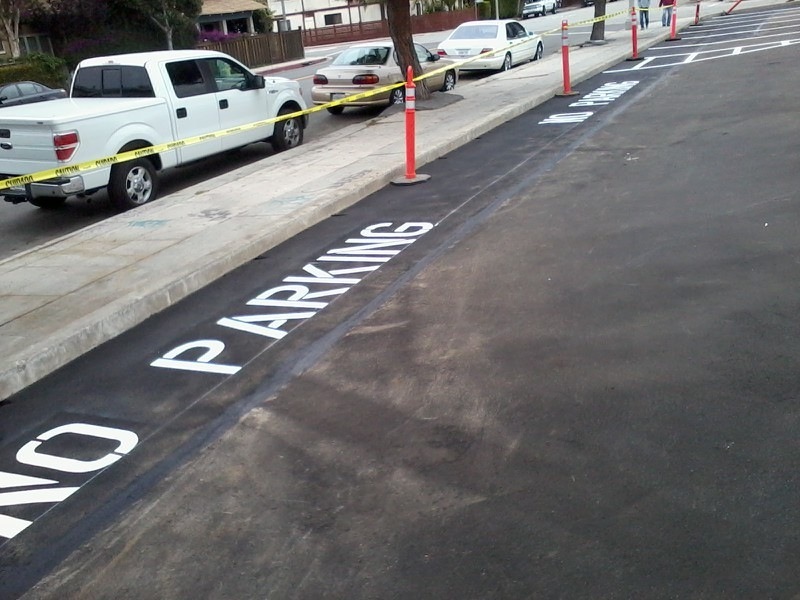 Initially, the lot is thoroughly cleaned and, if necessary, stripped of weak, unstable asphalt that is replaced. In most cases, cold planing (grinding) is necessary, especially where the existing asphalt meets a flush concrete transition. 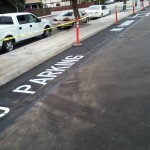 The grinding down of the existing pavement at the edges allows for full overlay thickness at these key connections, thus eliminating the need to feather the asphalt at the edges where thickness is so important. Next, hot oil is applied (bonding coat) and a sheet of fabric is carefully and immediately rolled over the hot oil. 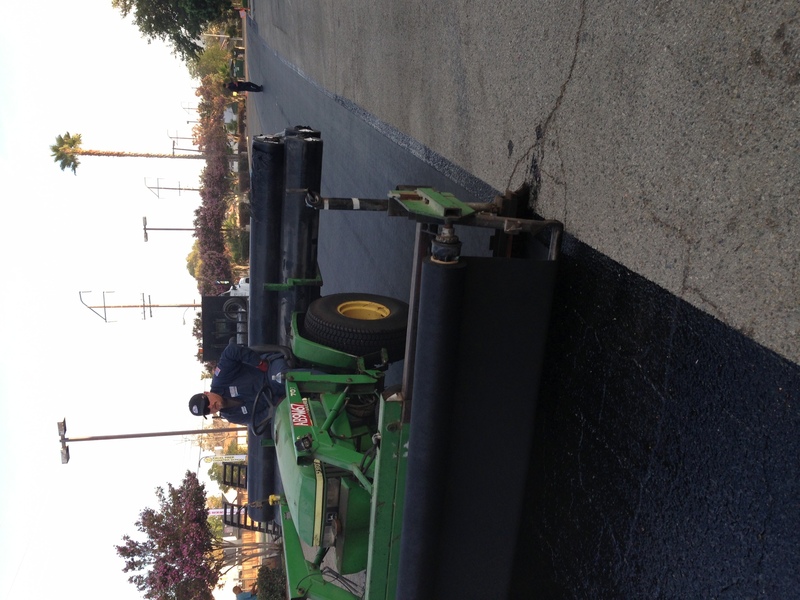 The fabric is then topped with approximately 1 ½ to 2 inches of new asphalt and compacted with a heavy roller. Old cracks will typically rise back to the surface over time, but the Petromat fabric acts as a barrier between the old pavement and the new, fighting against and slowing the rate of reflective cracking. Additionally, the fabric acts as a water barrier, preventing water from seeping beyond the asphalt and creating a weakened substructure. Finally, when cracks do show through, they’re typically more hairline in appearance. When necessary, these can be easily maintained with a simple application of regular seal coating and crack filling. 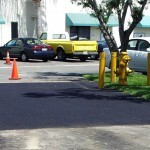 Seal Coating – A critical component of asphalt maintenance is seal coating. 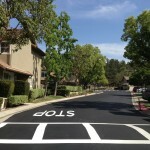 Not only does this process provide your asphalt with a cleaner, more vibrant look for visitors, it seals the top layer and prevents water from penetrating the surface. Oxidation, water runoff, excessive heat and heavy automobile traffic are the most common exposures that tend to speed up the deterioration process. Think of the process as waxing a car, a way to protect the expensive paint while providing the vehicle a shiny new look. 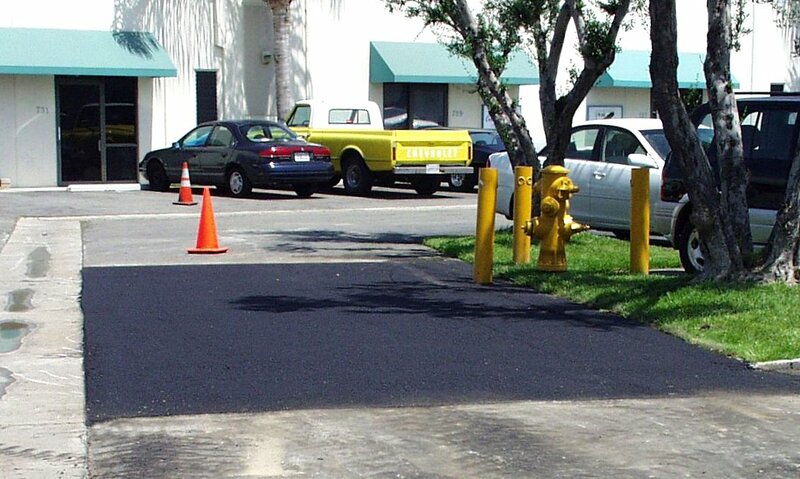 Coupled with necessary asphalt repairs, your parking lot can look new again and extend the life of the asphalt while reducing costly repairs over the long haul. If the rocks in your asphalt are visible and you’re losing sand, it’s definitely time to reseal your lot and avoid further deterioration. Allstar Paving recommends that you apply a fresh coat of sealant approximately every three years.